Description. This is the circuit diagram of a 3 LED bar graph type battery monitor circuit that is ideal for monitoring the voltage level of an automobile battery.When battery voltage is 11.5V or less transistor Q1 will be On and the LED D1 will be glowing.When battery voltage is between 11.5 and 13.5V, the transistor Q2 will be On and the LED D2 will be glowing.When battery voltage is above 13.5V the transistor Q3 will be On and the LED D7 will be glowing. Circuit diagram with Parts list. Notes. The battery to be monitored can be connected between the terminals namely A and B. It is always better to use LEDs of different colour. I want to by the project kits. On Sept12.2011 in response to a query from another reader with regard to components values for highr voltages,you have mentioned that you’ve comments about this circuit in the 26th Nov.section. Where/how do I find it? Thanks. 26th nov 2010 i have given the operation of the circuit. If the voltage tolerance of the zener diodes are more you get for different voltage. Now you select the zener for the voltage in which the circuit should operate and adopt the same circuit with different zeners. in fact for say 6 volt battery you can use D6 as 5.1 volt and D10 as 6 volt zeners and so on. When D7 light is on, D2 light should be off right? But how come the D2 light doesn’t turn off at 13.5 V (but D7 is on). We used 1N4740A as a replacement for BZX9C10 and 1N4742A as a replacement for BZX9C12. Hi Ankit it will still indicating the battery terminal voltage only. if I connect the charger to charge the battery what will be the status of all leds. Hi Vuyolwethu Please go through my nov26th comment which gives you the operation details and the check. Hi Reez this is a proven circuit, provided you use good quality 5% tolerance Zener Diodes. 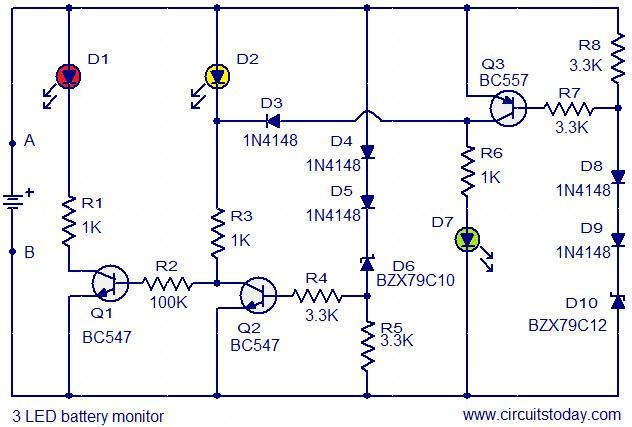 does this circuit really work? i’m working on my final semester project and i got my hands full on 4 different circuits already. so i need to be sure that this works well as time is very limited for my project. hi guys can any one tell me wat to do for a 6v battery circuit. PLS DONT KEEP PROMOISES THAT U CANT KEEP, I HAVE BEEN WAITING FOR SO LONG, AND NOT A WORD ABOUT THE SEQUENTIAL LED U SPOKE ABOUT. Still working on the sequential LED circuit!!! at 13.3 and 13.4 volts D7 and D2 both are lightning. can some one tell me how can i avoid it??? Hi Patrick I am on it soon you will hear from me. Any luck on the above!!!! can i hav ur email id please.. i have some more queries about this circuit…. thanks a lot….. but i really couldn’t understand the functioning of the circuit. Hi Fahad you can provide a fuse of say 500mA (even 100mA will do if readily available) in the positive line from the battery close to the battery. some one was saying that we should add a fuse to it. what was that? where should the fuse should be added and of how much Amperes? In Place of battery let us connect a 0 to 15volt dc supply. slowly increase the voltage from 0. around 3 volts D2 will conduct through R3 R2 and BE junction of Q1 – Q1 will get biased and D1 will light up. further incresing the voltage at around 12volt D2 D5 D6 conduct through BE junction of Q2. Q2 conducts – D2 lights up and D1 goes off. further incresing the voltage D8,9,10 conduct through Q3 BE junction biasing Q3 – D7 glows. Q2 collector current flows through D3 and Q3 CE hence D2 goes off. only D7 glows. by decreasing the voltage the process will get reversed. Hi Ralph The zener may be of a higher tollerance one. even then around 14 volts it should lightup. normally 12 + 2 forward diodes + one be junction. that is 13.8 volt is minimum requirement. I tried simulating it and D7 doesn’t light up when the battery voltage is over 13.5V. wonder why??? Can I also use other low power transistors ? I have BC 108 and BC478..
Hi Tom you can use any normal junction silicon diode. Even a 100mA fuse will do to protect. 1. Cars have devices to stop overcharging, and a warning to tell you if your battery isn’t charging, so you’d only need this circuit if say, your alternator warning light wasn’t working & a repair was expensive. 2. A car battery can deliver 100s of amps so it’s quite important to put a low value fuse in this circuit for protection, car fires are sometimes caused when a high and low power circuit short together – the low power cable gets so hot. The circuit will take less than 0.05 amp so a 1 amp fuse would be suitable. 3. Maybe the circuit designer could add a fuse ? nice one, I’ll try this on my car soon, but can you please tell is the BZX79C12 a zener diode, can you post is it a 12v zener diode or something else ? will this circuit handle the car batter amps ? Hi Tom You are right it is D7. Hi, this is a really useful circuit for me as I’m planning to do a workshop on bike-powered generators. I had planned to include all parts in the workshop price, but I now see that this is too expensive, a battery charge regulator alone can cost over Â£100 ! I’ve decided to dispense with a regulator and just make this circuit which will cost a few quid. Just one typo – In the circuit description you refer to to the overvoltage LED as D3 when it’s actually D7.